Theory of Colloid and Interfacial Electric Phenomena is written for scientists, engineers, and graduate students who want to study the fundamentals and current developments in colloid and interfacial electric phenomena, and their relation to stability of suspensions of colloidal particles and nanoparticles in the field of nanoscience and nanotechnology. The primary purpose of this book is to help understand how the knowledge on the structure of electrical double layers, double layer interactions, and electrophoresis of charged particles will be important to understand various interfacial electric phenomena and to improves the reader's skill and save time in the study of interfacial electric phenomena. 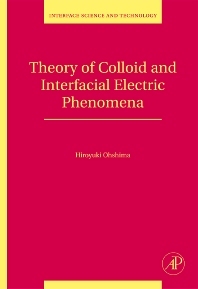 Also providing theoretical background and interpretation of electrokinetic phenomena and many approximate analytic formulas describing various colloid and interfacial electric phenomena, which will be useful and helpful to understand these phenomena analyse experimental data. Hiroyuki Ohshima is a Professor of Pharmaceutical Sciences at the Tokyo University of Science, Japan. He is the author or co-author of 10 books and over 300 book chapters and journal publications reflecting his research interests in colloid and interface sciences as well as biophysical chemistry. He spent his post-doc life at University of Melbourne, State University of New York at Buffalo, and University of Utah. Dr. Ohshima received the B.S. (1968), M.S. (1970), and Ph.D. (1974) degrees in physics from the University of Tokyo, Japan. Currently he edits two journals, Colloids and Surfaces B: Biointerfaces (Elsevier) and Colloid and Polymer Science (Springer).